Prefer to have the class or party outside your home? No need to go to Soho to hold an event in a stylish or casual ambiance. We can gather at several rental locations in Bergen County. From elegant to practical venues for cooking classes, demos or wine tastings we provide options to fit your party size (starting with 10 people) and budget. A cooking get-together is a clever alternative to the classic office party and an effective, fun way to bond with colleagues, entertain business associates or friends. Everyone will be smiling long after the cooking is done. Having a cooking party outside your home is a smart choice to celebrate; you are free to enjoy the company of your friends and guests (no fixed seating like in a restaurant) and do not need to get your house ready for the occasion, nor clean it up afterwards! 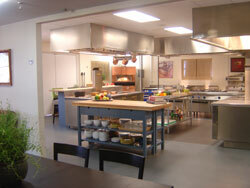 Any class or event can be arranged by appointment at your convenience, pending the facilities availability. Our goal is to provide you with fun, an ultimate culinary and learning experience and professional service. Four workshop classes; a combination of lectures, practical tips, hands-on experience and a meal at the end of the class. Each lesson is a combination of the workhop program and takes about 4 hours, pending material contents. Dates per appointment, can be taught also during the week or evenings. Perfect for beginners, parents & teens, college students, or anyone who'd like to acquire basic skills and find out that cooking IS fun! Learn 'tricks-of-the-trade' from a professional chef. Advise on how to create a stock of useful ingredients you can draw on from day to day. You'll learn about dry goods, spices, seasonings, oils & vinegars, condiments, storage and expiration dates. Practical tips on equipping your kitchen, avoiding expensive mistakes. Gadgets, pots & pans, measuring, mixing and processing tools. And we eat what we cook! We'll prepare an omelet, soup, salad, dressing, roast some vegetables and/or potatoes and use pan frying or oven roasting methods. we'll learn the appropriate cooking method and touch base on sauces. Baby Lettuce Salad with warm Cassis Vinaigrette – this rather extravagant salad is an experience! It combines sweet, savory and rich flavors. Delectable greens dressed in vinaigrette from hazelnut (or walnut) oil, shallots and, of course, Cassis (the traditional flavor of the Burgundy region), balanced with pear slices and chopped hazelnuts. Boeuf Bourguignon à la Classique Façon (Beef Burgundy), the famous dish, born in Burgundy. Chunks of beef, bacon, pearl onions and mushroom caps will melt in your mouth! Pommes Frites (French Fries to us), baked and served on a side, complement the Beef Burgundy as the ultimate comfort food! Cassis Crisp – with French Vanilla Ice Cream is our finale to this menu. This classic Burgundy’s dessert is a must to round up a meal. This Crisp is a French version of the American-style fruit cobbler. Strawberries, blueberries and raspberries drizzled with Cassis and crisped with lemon laced cookie crust. This dessert, enjoyed along with a glass of virgin Kir, will let you forget the world outside and transport you miles away…..! Parties are planned! anytime! Chef Blažena will demonstrate how to put French twist on abundant ingredients from our Garden State and create vibrant flavors of Provence. Provençal Potato Salad with Shallots and Sherry Vinaigrette is so easy to prepare and is an absolute winner any time. Great to bring along to your BBQ party. Bistro cooking has been around for at least a couple of centuries. While edgy food trends go in and out of style, this down-to-earth approach is always popular. Bistro fare is simple, satisfying and comforting. It's a style that takes basic, often inexpensive ingredients, using seasonal ingredients, and turns them into comfort food at its best. Tarragon-Dijon Tomato Salad -juicy slices of ripe tomatoes, garnished with red onion and parsley, dressed in special Tarragon-Dijon dressing deliver a delicieux salad with zing. Coq au Vin Blanc - Chef Blažena’s visually pleasing adaptation of the famous dish, modified with a white wine, adds a delicious twist on the quintessential “plat du jour” fare served all over France and the world. Parsleyed Potato Wedges - traditionally, the Coq au Vin is enjoyed with crusty farm bread. For a nice meal, elegant enough for the ‘special occasion’ dinner, it is served over rice or parsleyed potatoes, as we’ll taste in the class. Its better than going to a restaurant: an ambiance of a private home an elegant bar on hand, nothing to clean up after your party, just sit back and enjoy the company of your friends. Or, if you are ambitious, have fun learning to cook and enjoy your favorite fare! **************************************************** ITALIAN COOKING SERIES (just like Nana's; for you, foodies, who like to eat and cook Italian). Blažena's interest in Italian cooking started in her teenage years, when she learned the culinary basics and secrets from Signora Georgina at the Italian Embassy in Prague. Blažena practiced cooking away with her daugter Giovanna (no living in Verona) and they are still close friends; years later and miles away - makes no difference! Other link below YEAR OF COOKING with Chef Blažena, introduces detailed menus ideas and classes description. Lessons are offered evenings, by appointment. Thank You for your visit and Have a Delicious Day. Happy Cooking, Happy Eating! Remember, life is short and every day is a fête!